Happy April friends… time to play with a new Assemble This Sketch. It’s a pretty one and I’ll hope it will spark lots of inspiration. Lots of options again. Something circular in the center… layered or not layered. Up to you. Then something on half of the card in the background. I’m thinking either patterned paper, a background stamp or dry embossing. These are just a few things that popped into my head. Shall we see what happened? I decided to go for the gold with this sketch. I’ve had this DCWV paper pad forever and I’m bound and determined to make some cards with it. I created the split background with two different patterned papers and then layered my sentiment over the paper doily. So easy peasy. Ready to see my gold embossing in action. Here is the Assemble This! video, you can also watch it on YouTube HERE as well. I’m keeping them short and sweet and under 2 minutes. No jibber jabber, just creativity in action. Hope you enjoy. Add your link below… I’d love for you to share with me if you use the sketch and if you want to visit each other too. That would be fun. I’ll close the link up at the end of the month so we can get prepared for a new one next month. Thanks for stopping by and I hope you’ll be inspired to Assemble This Sketch too! yay! I always love your sketches Lisa!!!! your card is beautiful! 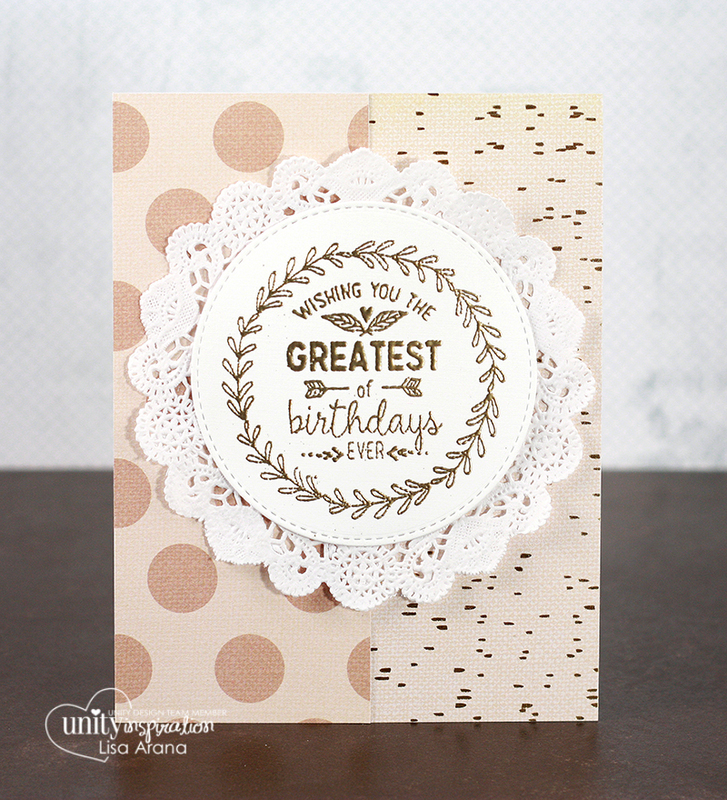 Oh so gorgeous, loving the doily and the subtle shades! This definitely has lots of possibilities, Lisa! And your card is beautiful. Lisa, your card is beautiful with the natural colors.